The spectacle that was the Beijing Olympics of 2008 will hardly be forgotten by anyone who saw the opening ceremonies or the awe inspiring performances from athletes. While there was ample cable-coverage of the games, one particular segment of this Olympiad that was sorely under-represented was that of the Olympic Regatta held in Qindao. Make no mistake. These sailing events were a big to-do. As with Beijing, Qingdao was in preparation for these events for years. Included in this preparation came a special commission from the IOC (International Olympics Committee) for the composition of a suite of music to represent this Olympic regatta. Veteran film composer JEFF RONA became the choice of special committee for this daunting task. The idea of "water" and Jeff Rona are certainly no strangers. Back in 1996, Rona composed the score for WHITE SQUALL, which was when my eyes and ears were first opened to his talents. While he has since completed a bevy of projects, another "watershed' project came with last year's release of the award-winning documentary, SHARKWATER. As important as those projects may have been, neither approaches the scope and weight of writing music for the Olympics. JEFF RONA has long excelled at delivering scores that trend towards ambient-electronica experiences or projects that make use of his expertise with ethnic wind instruments. Admittedly, when I found out that he was on this Olympic project, I wondered how his talents would translate. 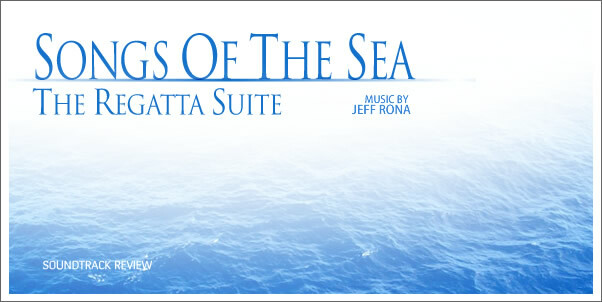 In short, SONGS OF THE SEA is unlike anything I have heard from JEFF RONA before. He has delivered a bold and inspirational orchestral suite that is every bit worthy of connection to this premiere world event. The only tragedy is that the events which this music represents were so poorly covered that comparatively few will have little to no knowledge of this project's existence.